WASHINGTON – Ohio Gov. 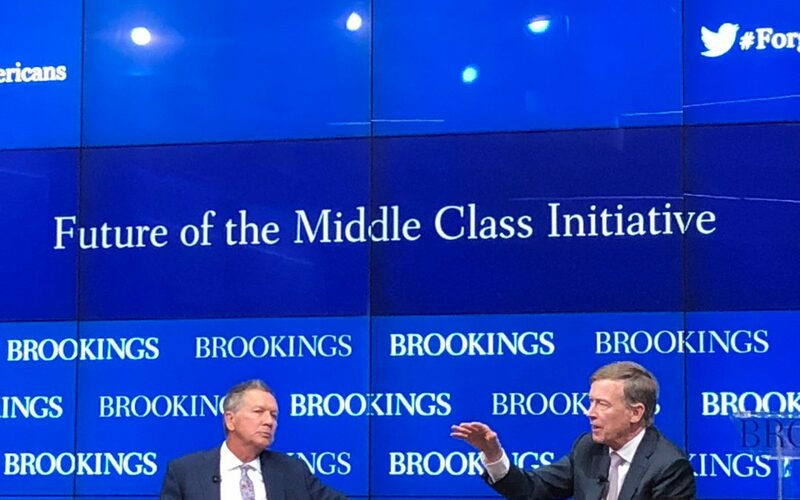 John Kasich, a Republican and Colorado’s Democratic governor, John Hickenlooper, D-Colo., said Wednesday the labor and education systems are broken and can’t be fixed until politicians stop vicious partisanship to help the middle class. Speaking at the Brookings Institution, the pair set the tone for the event with some good-natured political wordplay. Despite the crowd’s cheers for a bipartisan presidential ticket in 2020, the pair did not deny nor confirm the prospect. They both said if they had to pick a partner from across the aisle they would run together because of their strong work relationship. Hickenlooper, reflecting on a time when he was unemployed, said governments don’t do enough to train and prepare the unemployed for jobs. “Our education system simply doesn’t work,” said Kasich. “It’s easier to reform the Pentagon than the K-12 system,” he added. One of the examples of successful training that works outside of the college and university system was 42, a private nonprofit and tuition-free engineering school in Silicone Valley. During Hickenlooper’s visit to the school, he met a student in their mid-30s whose job was loading tractor-trailers.